Up to now I have been getting my testing supplies in the mail, so, first, I figured I'd try to hook up with another mail order company. I went to the list and started to call the mail order suppliers. Of the venders on the two pages comprising the list, not one supplied the Accu-Chek Softclix Lancets and the Accu-Chek Aviva Plus test strips that I've been using. You might think that someone who was in the business of selling diabetic testing supplies might keep an inventory of a number of different brands, but no, these venders had a very narrow selection to choose from. I'm sort of partial to my Aviva meter because it requires less blood and when I go to my doctor she can plug it into her computer and get a readout of all my tests since the last time she saw me. I don't want to change equipment at this juncture. In addition, some of the suppliers on the Medicare list informed me that they did not offer diabetic testing supplies and they couldn't imagine how they wound up on the list. I was forced to move on to the local pharmacies. First, I thought I'd give CVS a try. They were only a mile down the road. I went there with my prescriptions and was immediately told by the young lady working the counter, who was pecking away at her keyboard like one of Skinners pigeons, that I was not eligible for Medicare. I let her know that she and her computer were sadly mistaken since I'd been on Medicare and receiving benefits for more than a year. Nope, she affirmed, I was not qualified. She sought the help of another worker who determined that she had entered my Medicare account number incorrectly. Finally, we were making progress. Next, she wanted my drug provider's card. I explained that that wasn't necessary because testing supplies were not considered a drug, they were covered under Medicare B the balance to be picked up by my supplemental insurance. No, she wanted my drug card. So, though she didn't really need it, I gave it to her. She was ready to roll. I watched as she came out from behind the counter went to the shelf where the lancets were kept and pulled out a box of 50. My prescription called for 400, a 90 day supply, but 50's a start. Unfortunately, as I pointed out to her, the lancets she had chosen were not the kind I required. She was under the impression that all lancets were the same. No, I said, not hardly. I didn't want to sound like a broken record, but I thought it important to convey to these people, and by now I'd drawn the attention of several including the rotund and bespectacled pharmacist that these supplies were covered by Medicare Part B and my supplemental. I did note also that according to the information on the Medicare site CVS accepted the Medicare payment as payment in full so no supplemental would be required. They knew better. Their lack of understanding about how Medicare worked especially in regard to testing supplies was very frustrating. I couldn't believe they had never had to deal with this issue before, but evidently they hadn't or, if they had, they'd been dealing with it improperly. "Can’t you see?" I responded. "I want my prescriptions back." They were not quick to comply, forcing me to add, "Now!" There was a Walgreen's across the street, but fearing that employees there might have succumbed to the same environmental factors that had rendered the CVS crew stupid, I decided to cruise down the road to the Publix where, according to the website, they also accepted the Medicare allotment as payment in full. The girl working the counter at Publix was not appreciably more informed than her counterpart at CVS. Fortunately for me, though, the pharmacist, Adrienne was a gem. What she didn't know already, she took the time to find out and in due course I was phoned a few days later and told that I could pick up my supplies the next day after 2 PM. I got there around two thirty and saw that Adrienne wasn't on duty. This wasn't immediately alarming, but when the girl asked for my insurance card I knew I was in trouble. Once again I tried to explain to these health professionals, the substitute pharmacist included, that testing supplies were taken care of by Medicare Part B. When they wanted to charge me twenty bucks, I informed them that my supplemental insurance would pick up the balance. They refused to consider this possibility, implying that I was confused. The pharmacist was particularly adamant, insinuating that I didn't know what I was talking about. So, I paid the money and got out of there with my supplies before they changed their mind. By this time I was almost out of test strips and couldn't start all over again with another drugstore. Subsequently, I called Medicare, and Florida Blue, my supplemental, and both affirmed that I was right. Big deal, being right hadn't done me much good so far. A rep from Florida Blue called Publix and tried to explain to them how these transactions are supposed to go down with Medicare paying most and my supplemental picking up the rest. I don't know who he talked to, and I don't know if they believed him. But, I'm still waiting to hear back. 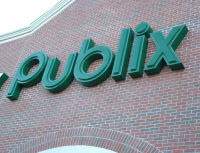 He suggested that if Publix didn't straighten out the problem and give me my money back, I should seek out another vender. Easier said than done, I say. Which brings me back to where I started. Why were these changes made? Whose bright idea were they? Why am I now forced to deal with a bunch of people who don't know the first thing about Medicare, when the people at the mail order house had been thoroughly schooled in the proper procedures? Do any of the geniuses in Washington actually think this is better? For who? That's what I want to know. For who? Muirfield Golf Club, Hole 4 Next week, July 18–21, world golfers will gather in Gullane, Scotland, at the legendary Muirfield links course for the 2013 British Open or, as it's known in Great Britain, The Open Championship. Muirfield Golf Club, Hole 13 The Open Championship was first held at Muirfield in 1892 and has been contested there fifteen times, most recently in 2002 when Ernie Els won the championship. Among the previous winners are Nick Faldo, Tom Watson, Lee Trevino, Jack Nicklaus, Gary Player, Walter Hagen and Harry Vardon. Muirfield Golf Club, Hole 3 Nicklaus once described Muirfield as "the best golf course in Britain." But the course Jack remembers has been altered by several subtle changes. Over the winters of 2010 and 2011, changes were made at fifteen holes to ensure that Muirfield remained a challenge for the world's best golfers. Those changes included several new bunkers in selected drive areas, moving greenside bunkers to tighten the entrances to greens, the enlargement of greens to provide more championship pin positions, and the introduction of six new championship tees lengthening the course to 7245 yards. Perhaps, the most noticeable difference involves the 9th Hole which is now a difficult par 5, particularly when playing into a prevailing wind. The photos of Muirfield as well as other golf course posters can be found on my sports website sports.aceswebworld.com. If you have decided you need a framed landscape to decorate your wall, you might want to condider the work of Albert Bierstadt, a master known for his paintings of the American West. 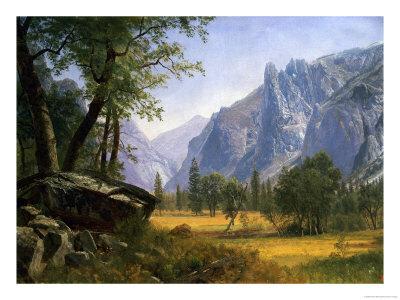 Born in Germany, Albert Bierstadt (1830 – 1902) is best known for documenting the beauty of American West’s scenery while on several expeditions of the Western Expansion. He founded the Rocky Mountain School of Landscape. Painting through his precise, natural and light-drenched artworks. Bierstadt painted huge, dramatic images of the Rocky Mountains and Yosemite with the hope of recreating their splendor for Easterners. 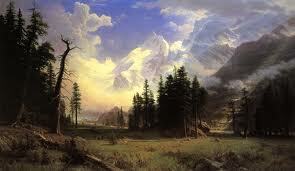 Bierstadt was born in Solingen, Germany. His family moved to New Bedford, Massachusetts, in 1833. He early developed a taste for art and made clever crayon sketches in his youth. In 1851, he began to paint in oils. He studied painting with the members of the Düsseldorf School in Düsseldorf, Germany from 1853 to 1857. He taught drawing and painting briefly before devoting himself to painting. Explore the work of the world's greatest artists at my webpage, AcesWebWorld.com. "Hanging tapestries is a clever way to change a room's focal point." "A well-chosen and well-placed tapestry will become the centerpiece of your room." "A tapestry can accent the existing colors of your room or provide direction to future color choices." 52 in. x 50 in. 71 in. x 48 in. 26 in. x 63 in. Trust Your Eyes. If I ever wrote a novel, which I'm not likely to do, I would love to have a blurb on the cover quoting Stephen King that read, simply, "Riveting." I've read a lot of novels that Mr. King recommended and I've never been disappointed. But, when it comes to the novels of Linwood Barclay, I need no encouragement. I've read all his novels and I can tell you that each was "riveting." In "Trust Your Eyes" Barclay has again taken ordinary people and placed them in extraordinary circumstances. Murder's in the air and, if our naive protagonists aren't careful, it just might blow back in their faces.